In 2013, I released 101+ Pro Style Pistol Offense Plays. This interactive book is the first of its kind, blending the information you normally get in a coaching book-text, diagrams, and coaching points, with the information you normally get on a DVD – video and game film. The innovative format is able to go way beyond what you get in a book or DVD, giving coaches a depth of knowledge well beyond the other coaching products on the market. 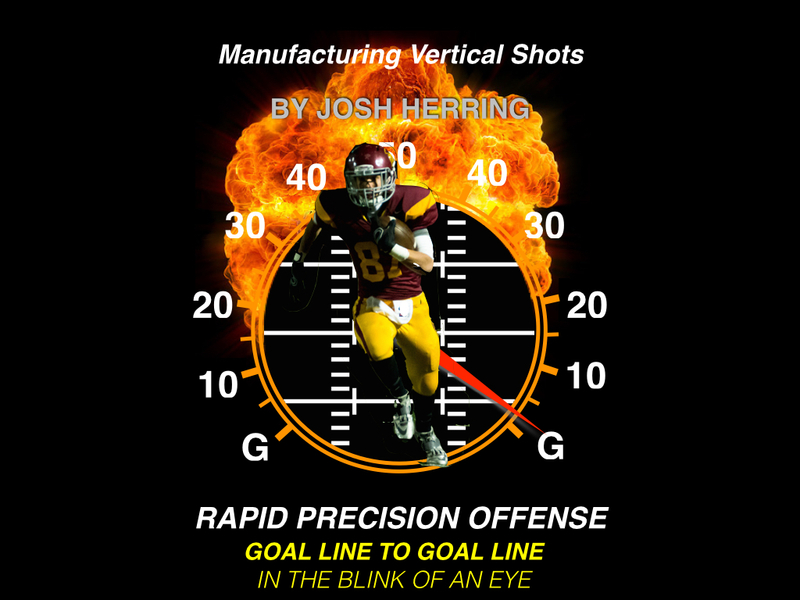 I released my second interactive book in March 2014 – The Zone Offense Create a Structured System. This utilizes even more capability of the technology, loading the book with 167 pages that included 662 interactive slides and 51 total minutes of video. 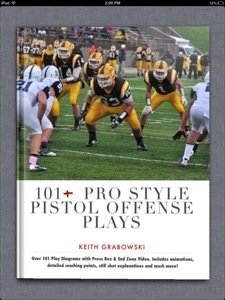 My new interactive book which will be released soon is 101+ Pro Style Pistol Offense Plays: The Read Game. This includes the details on running zone read variations, zone option, veer, power read, play action off of the read game, and gives ideas for developing other types of read plays. It will be available soon. In the mean time, check out my other two books. During our preseason camp I posted a thought on incrementalism. Incrementalism is making changes by degrees or in small steps. I really like the website www.aplayaday.com; it’s perfect for learning something new in this game everyday. The videos presented daily (Monday through Friday) are essentially mini-clinics. While you may not use that particular play or concept, you have a chance to learn about it, because at some point an opponent may use it. Because the videos are short, you can watch them while having your morning coffee, during your lunch break, or even between classes. The effect is you are learning or getting more detail on five concepts a week. Sometimes it’s tougher to carve out time to sit down and watch an hour long clinic video, but this concept of the mini-clinic is much simpler. If you have an idea that you would like to share, there are simple instructions for submitting your own material and helping others make this game better. I submitted a video. It’s up as a free sample that can be viewed here. The sample is from my iBook. My iBook 101+ Pro Style Pistol Offense Plays provides concepts that can be utilized in any offense, not just the pistol. The interactive multimedia book contains 229 pieces of dynamic content and q total of 30 minutes of game film. 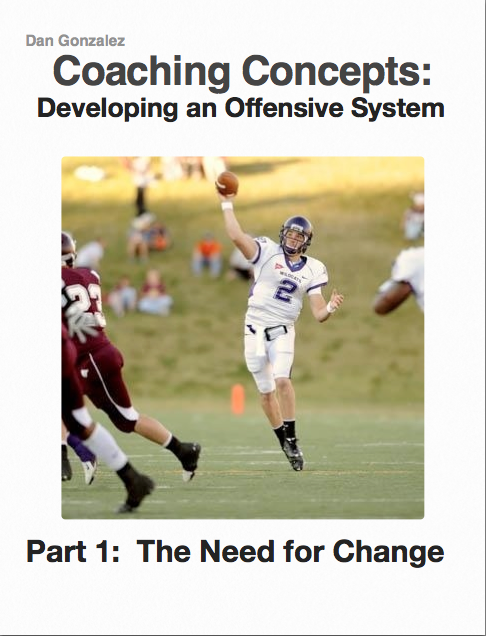 I have received some great feedback from coaches who adapted all or some of those ideas in 2013. Get 101+ PRO STYLE PISTOL OFFENSE PLAYS for your iPad or Mac from the iBookstore. Play action passing is a huge part of our offense. Being able to run the ball effectively and having a good play action game go hand in hand. Here are some resources from my notes on the play action passing game. Along with coaching presentations and articles, I’ve included good analysis articles that explain an offense’s plays with illustrated still shots, diagrams, and video. I have found a lot of statistical analysis which really shows the importance of having play action as part of the passing game. In most of the statistical analysis articles you will see that play action greatly enhances the team’s passing statistics and the quarterback’s rating. As an NFL coach recently told me, a good keeper turns into the same play that the QB was running in junior high and is easy to complete. Finally, I include a section of videos. All of the links in this post are to materials that are free. Read my AFM article on tying the run and pass together here. Read my AFM article on organizing a pass concept here. Download my PowerPoint on keys to effective play action here. View some of my play Action Cut-ups here. 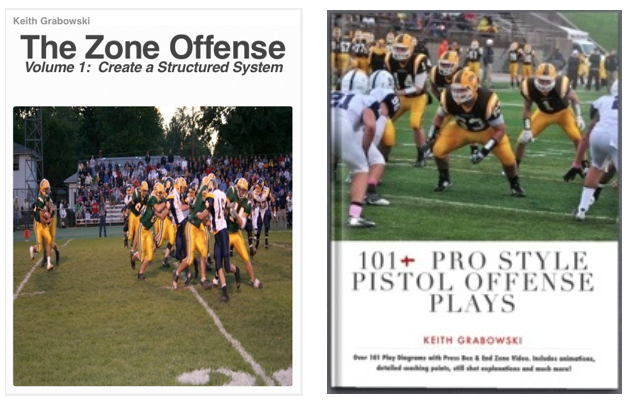 Play action is explained, diagrammed, and shown on video in my iBook 101+ Pro Style Pistol Offense Plays available for the iPad on the iBookstore here. Dub Maddox-Set-Show-Snap-Sell. Must watch on how to teach play action fakes. We use it at BW. When I started researching the zone running game about a decade ago, there were very few resources available. I was able to put together a binder of articles, some clinic notes, and I found a book and a few videos that I purchased. This post would have been like hitting the mother lode for me back then. The Internet is full of resources on this topic now. I owe my initial learning to some local coaches who were willing to give their time to sit down and teach me. I owe a lot of my initial learning and foundation of the zone running game to Russ Jacques and Ron Lewis who are both great high school coaches here in the Cleveland area. Later, I learned from communicating with Bill Mountjoy after my first year of running the inside and outside zone. What I learned from him and a few others helped improve it and produced the Ohio HS Division I leading rusher and scorer in 2005. I posted some zone information from Coach Mountjoy here and here. The zone has become a very popular run because of its ability to be used in multiple formations and personnel groupings. This post includes over 150 links to information in the zone running game. All of the links will take you to information that is free. The zone running game is the basis of our pro style pistol offense. Learn more about it in my iBook 101+ Pro Style Pistol Offense Plays, and look for a three volume series from me to be released in the late fall. News Articles – these articles give some insight on to what coaches believe and why they are using zone runs.